The community coordinated their work via mailing lists and during various meetings. Developers of different simulation tools, including COPASI, SBToolbox, roadrunner, and VCell participated in the guideline development. In 2011, the MIASE guidelines were accepted by researchers from 19 different institutes. MIASE is a registered project of the MIBBI (Minimum Information for Biological and Biomedical Investigations). The guidelines are respected by the Simulation Experiment Description Markup Language (SED-ML), an XML-based format for simulation experiment encoding. All models used in the experiment must be identified, accessible, and fully described. The description of the simulation experiment must be provided together with the models necessary for the experiment, or with a precise and unambiguous way of accessing those models. The models required for the simulations must be provided with all governing equations, parameter values and necessary conditions (initial state and/or boundary conditions). If a model is not encoded in a standard format, then the model code must be made available to the user. If a model is not encoded in an open format or code, its full description must be provided, sufficient to re-implement it. Any modification of a model (pre-processing) required before the execution of a step of the simulation experiment must be described. A precise description of the simulation steps and other procedures used by the experiment must be provided. All simulation steps must be clearly described, including the simulation algorithms to be used, the models on which to apply each simulation, the order of the simulation steps, and the data processing to be done between the simulation steps. All information needed for the correct implementation of the necessary simulation steps must be included, through precise descriptions, or references to unambiguous information sources. If a simulation step is performed using a computer program for which source-code is not available, all information needed to reproduce the simulation, and not only repeat it, must be provided, including the algorithms used by the original software and any information necessary to implement them, such as the discretization and integration methods. If it is known that a simulation step will produce different results when performed in a different simulation environment or on a different computational platform, an explanation of how the model has to be run with the specified environment/platform in order to achieve the purpose of the experiment must be given. All information necessary to obtain the desired numerical results must be provided. All post-processing steps applied on the raw numerical results of simulation steps in order to generate the final results have to be described in detail. That includes the identification of data to process, the order in which changes were applied, and also the nature of changes. If the expected insights depend on the relation between different results, such as a plot of one against another, the results to be compared have to be specified. A detailed explanation of the MIASE rules is given on a separate page. The following, non-formal description of a simulation experiment performed on a model of circadian oscillations examplifies the use of MIASE. Modified version of the above model. Equations are contained in the SBML code. Change the parameter value of the maximal velocity of TIM messenger degradation (id "V_mT" in the model) to "0.28". Change the parameter value of the maximal velocity of degradation of the bi-phosphorylated TIM (id "V_dT" in the model) to "4.8". 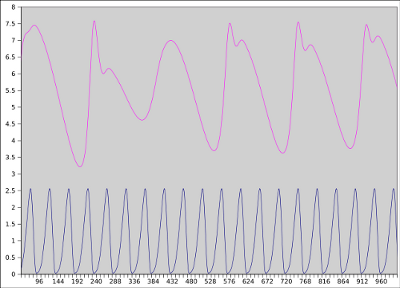 Simulation algorithm: Livermore solver for ordinary differential equations (LSODE, KiSAO:0000071). Run a uniform timecourse simulation over 1000 time points in an openly available simulation software, collect data from time point 50. Run the specified simulation on the original model and on the modified model. To gain the desired insight (chaotic behavior of V_mT and V_dT), plot time on the x axis, and V_mT and V_dT concentrations on the y axis. Create a 2D plot that contains the resulting curves for both versions of the model.